Nothing says “summer” quite like a big, juicy slice of watermelon. Even if you prefer it charred on the grill or blended into an icy agua fresca, watermelon is one of the best ways to beat the late-summer heat. So what gives watermelon its refreshingly delicate flavor? Turns out the answer is pretty complicated. Over the last few decades, scientists have identified dozens of flavor and aroma molecules that contribute to watermelon’s unique taste . 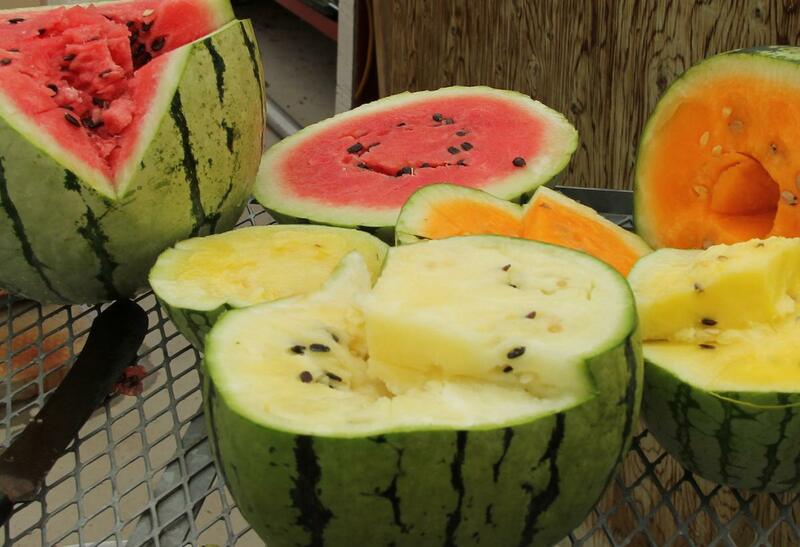 And here’s an interesting twist: a watermelon’s flavor has a lot to do with its color. Chow down on a yellow ‘Early Moonbeam,’ a pale ‘Cream of Saskatchewan,’ or a deep red ‘Crimson Sweet’ and you’ll likely notice different flavor profiles for each melon. Several of watermelon’s flavor molecules form when colorful chemicals called carotenoids break down into smaller chemical compounds [2,3]. For example, the classic color of red watermelons comes from lycopene, the same molecule responsible for the color of red tomatoes. When lycopene breaks down, it forms key flavor compounds such as lemon-scented citral. Orange melons don’t have much lycopene, but they make up for it with extra beta-carotene. This chemical – the same one that makes carrots orange – leads to a completely different set of flavor molecules, including floral beta-ionone. Colorful molecules called carotenoids break down into different flavor compounds. Figure adapted from . 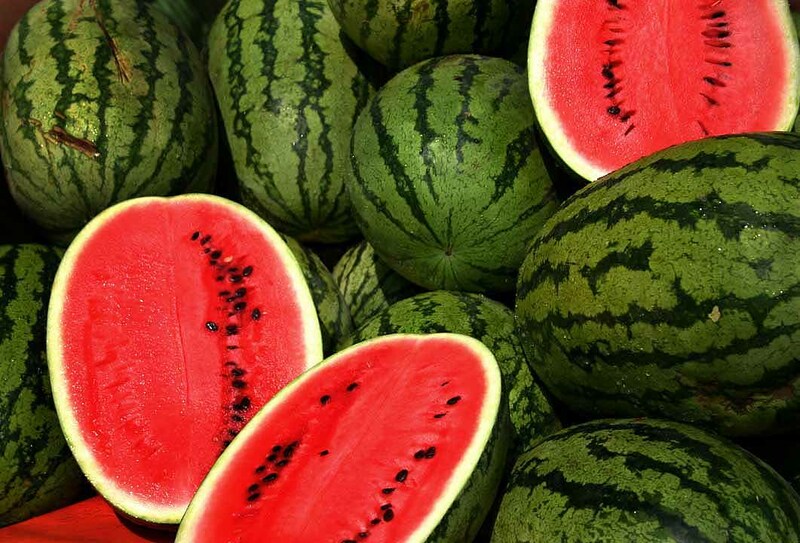 The chemistry of watermelon flavor is clearly complex, but scientists are still searching for individual molecules that mimic watermelon’s characteristic taste. Most recently, a study identified a single molecule – dubbed “watermelon aldehyde” – that has a very distinct watermelon aroma . Unfortunately (or fortunately, depending on your perspective), the molecule is too unstable to be used as a food additive. So for now, artificially flavored “watermelon” products will just have to keep on tasting nothing like watermelon. Good thing there’s plenty of real, chemically complex watermelon to go around. Yajima I, Sakakibara H, Ide J, Yanai T, Hayashi K (1985) Volatile flavor components of watermelon (Citrullus vulgaris). Agric Biol Chem 49: 3145–3150. doi:10.1271/bbb1961.49.3145. Lewinsohn E, Sitrit Y, Bar E, Azulay Y, Meir A, et al. (2005) Carotenoid Pigmentation Affects the Volatile Composition of Tomato and Watermelon Fruits, As Revealed by Comparative Genetic Analyses. J Agric Food Chem 53: 3142–3148. doi:10.1021/jf047927t. Lewinsohn E, Sitrit Y, Bar E, Azulay Y, Ibdah M, et al. (2005) Not just colors—carotenoid degradation as a link between pigmentation and aroma in tomato and watermelon fruit. Trends Food Sci Technol 16: 407–415. doi:10.1016/j.tifs.2005.04.004. Genthner ER (2010) Identification of key odorants in fresh-cut watermelon aroma and structure-odor relationships of cis, cis-3, 6-nonadienal and ester analogs with cis, cis-3, 6-nonadiene, cis-3-nonene and cis-6-nonene backbone structures University of Illinois at Urbana-Champaign. Available: http://hdl.handle.net/2142/16898. About the author: Liz Roth-Johnson received her Ph.D. in Molecular Biology at UCLA. If she’s not in the lab, you can usually find her experimenting in the kitchen. Tags: aroma, beta-carotene, carotenoid, chemistry, color, flavor, lycopene, molecules, summer, watermelon. Bookmark the permalink.